And inspire he has. For a mere $90, James Patterson has set forward a wonderful format of encouragement salted with reality, of humor mixed with practical advice as he provides an insight into what it takes to truly become ‘a writer’, using anecdotes and personal experience through video and written formats that enhance the lesson plans. More than anything, he impresses with his generosity and willingness to share the how-to’s and why’s of character building, plots and ideas with real-life examples, and offers positive feedback in an interactive format. Thank you, James Patterson, for your wit and wisdom, for your own perseverance in the face of adversity, and for caring that other writer’s ‘make it’. So, here I am, back on track with the first task, a new blog entry, looking for a song, for a melody in the flow of words–then on to finally finishing the last 3 chapters of Book 3 in The Spidy Chronicles, and the final book in The Entity Chronicles, while a murder mystery lurks insistently beneath the surface of the tidal pool. And because I awakened with determination and joy, so did my world. The sun broke through light fog and is shining unusually warm winter rays across the land. It is a quiet day in our little slice of heaven and all is well. My husband woke with renewed determination and he and Mom have ‘things they want to do on their own today’, so after finishing bills, laundry and meals, I’ll still have half the day to write. Yipppee! ‘Looking for the joy’ in writing brought to mind my ‘Box of Joy’, a gift from my thoughtful husband some years ago. But for it to make sense, you should know that I grew up two miles outside the middle of nowhere in Northwest Oklahoma, with few trees, little water and fewer people. Absent were the brisk fairy-tale New England autumnal celebrations with their valley wide splashes of rainbow colors dancing across hill and dale, gifting the earth with whirlwinds of fresh-fallen, brightly-painted confetti to play in–to roll around in or kick into piles–to entertain as flying carpets of laughter and joy. Chez-moi, these technicolor dreams were replaced by gales of grey dust and wind, where the few, dried, spent leaves spilt by drought-worn trees traveled horizontal, like projectiles, flying at the same speed as the ever-present wind and tumbleweeds, not staying long enough in our county to ‘pile up’ unless caught by weed or windrow. Some days it seemed not safe to go outside without goggles or glasses. …So when we settled in North Texas and discovered the small disc golf park nearby with its acres of ancient oak and pecan trees, I used walking the dog and disc-golf as an excuse to ‘go play in the leaves’. 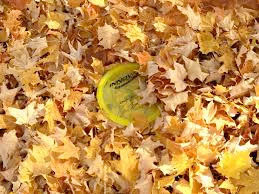 Throwing a disc at the baskets is now secondary each autumn, as piles and swirls of golden oranges and browns beckon me to come play in a stirring up of memories of summer gone by with the changing of the guard. “This emergency kit contains a collection of only the finest quality of unkicked dried leaves, which have been packed in a special atmosphere of 81% Nitrogen, 16% Oxygen, 2% Carbon Dioxide, and other special gases to preserve freshness. Feel the bliss of kicking the leaves as the joy of life settles over you. Not to be used under supervised conditions. The note and the care with which it was written, my soul-mate understanding the root of who I am in my child’s heart, has far-outlasted the box of leaves, and left the indelible imprint of joy on my life. Thank you, dear husband, for the memory. And Thank you, James Patterson, for encouraging me to remember my ‘joy’.